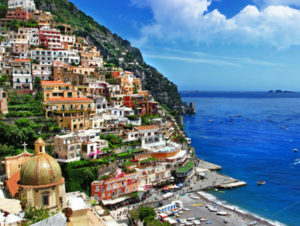 After we’re having analyzed the first part of this special classification, we’re going to analyze right now the left 5 wonders of the Amalfi Coast. As usual, we’re talking about enchanting places, that really worth it to be visited visit, at least once in a life! Positano! Is one of the most well-known places of the Amalfi Coast! If we’ll override it, that would be really outraging. It is a really enchanting destination, of an amazing beauty. You can visit it at day and at night in as well, with no distinctions! A very elegant and charming place. Ravello is of course one of the most élite place of the Coast. Enjoying with its beautiful view, on the meanwhile you’re relaxina on its several terraces, that may have a very favourable effect on mind and body wealth. If you want to have a fancy tour, visit Ravello! It is the right place where you can do it! A little village overlooking the sea. Conca dei Marini can offer attractions and amazing places, since one of its beautiful beaches, wet from a very beautiful crystalline water. In addition to that, it is the nearest places get to the amazing “Emerald Grotto”, a natural cave, quite similar to the “Blue Grotto” on Capri, because of its beauty. Thene, Conca dei Marini is the place of birth for sfogliatella. Indeed this sweet is the symbol of this place. Atrani is a fancy place, full of traditions. Indeed, in this city there are the churches of San Salvatore del Birecto and Santa Maria Maddalena Penitente; both of an unique beauty mixed to a memorable style. How you can si from the picture above, you can relax on Atrani’s beach and go swimming there. 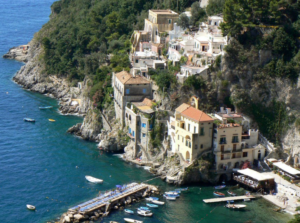 The last but not least of the places to visit on the Amalfi Coast is for Vietri sul Mare. We’re naturally, not talking about its aesthetic aspect, instead that this place is really enchanting! Rather, Vietri sul Mare, is the last city of the Coast that mark the boards with Salerno. It is the perfect place to conclude your visit on the Amalfi Coast!